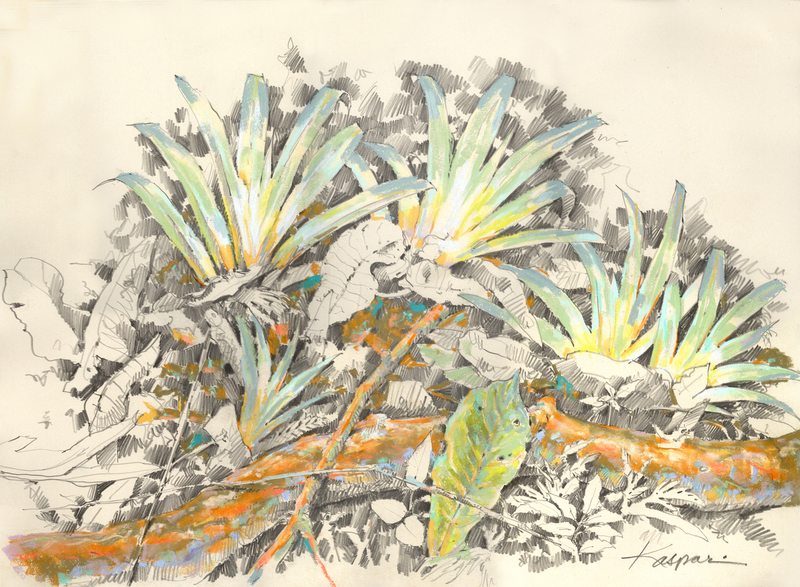 These were drawn on location in the rainforest of Panama’s Barro Colorado Island in 2009. They are pastel and graphite on either Rives BFK or Canson Ingres paper, 18″ x 24″. Big leaves gather more light on the forest floor. 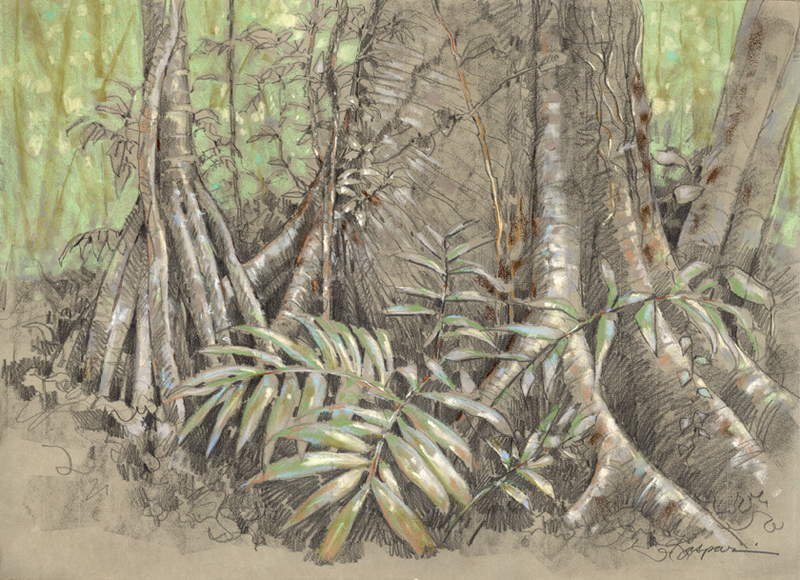 24″x18″ pastel and graphite on Rives BFK, drawn plein air on Barro Colorado Island. 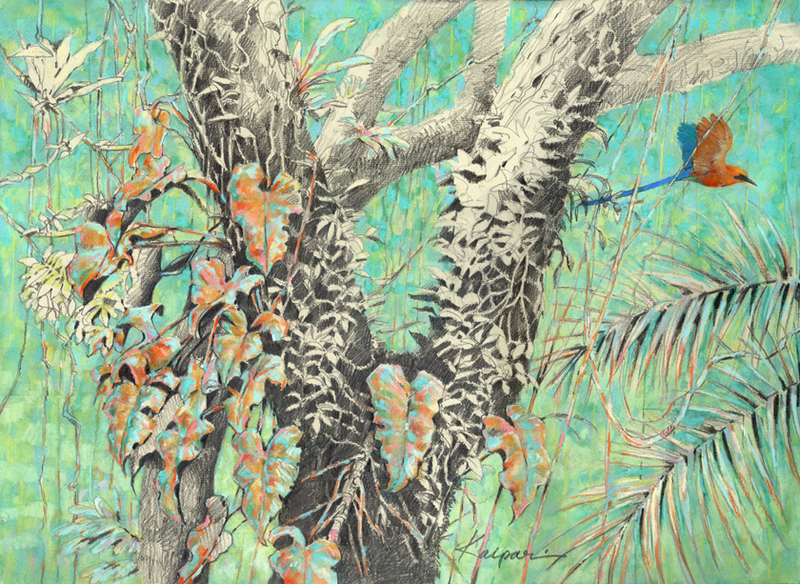 Rufous Motmot flies past a vine-covered tree; 24″x18″ pastel and graphite on Fabriano Ingres toned paper, drawn at 75′ up in the air on a scaffold. At the edge of a clearing, palms and heliconias grow in profusion. 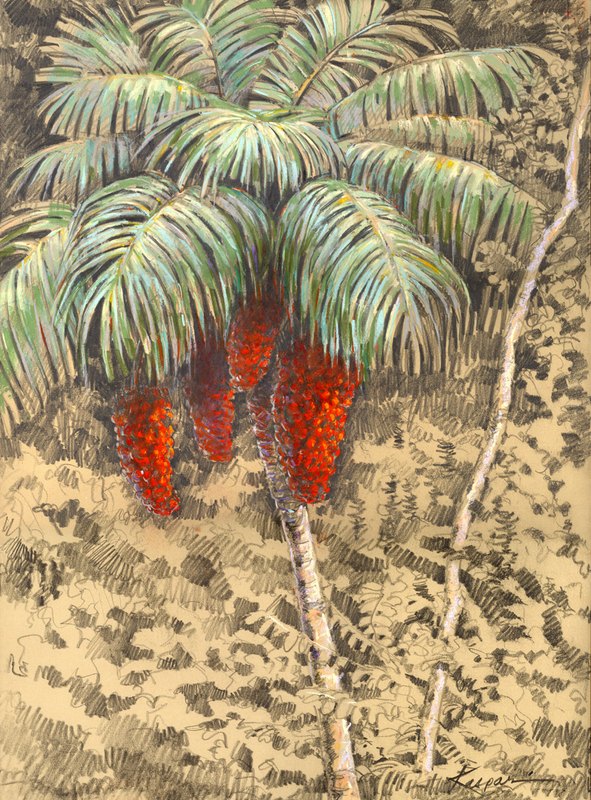 24″x18 pastel and graphite plein air, drawn on Barro Colorado Island. A palm tree on stilts and a canopy giant with buttresses; two strategies for holding on to the ground in thin soil. 24″x18″ pastel and graphite on Fabriano Ingres toned paper. This small understory palm catches falling leaves, benefitting from nutrients as they decay. 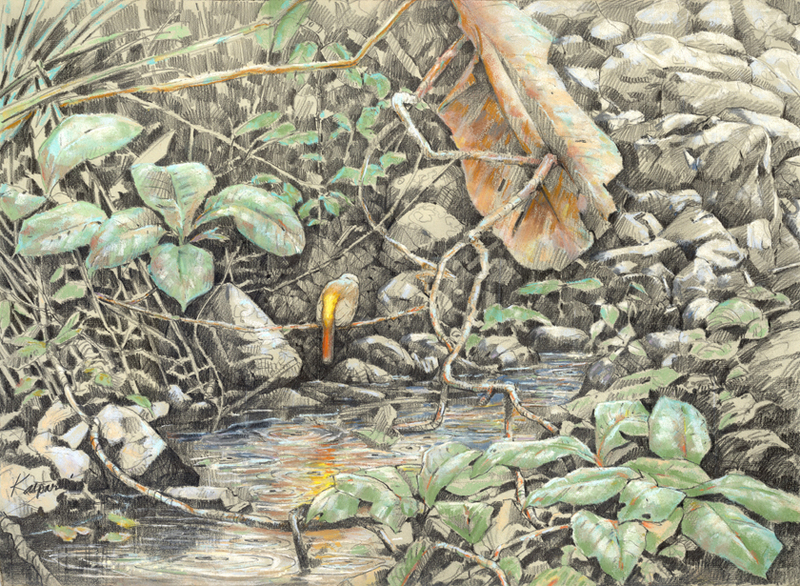 18″x24″ pastel and graphite on Rives BFK, drawn plein air on Barro Colorado Island. Long sprays of a bright yellow orchid blooming on the side of a tree. 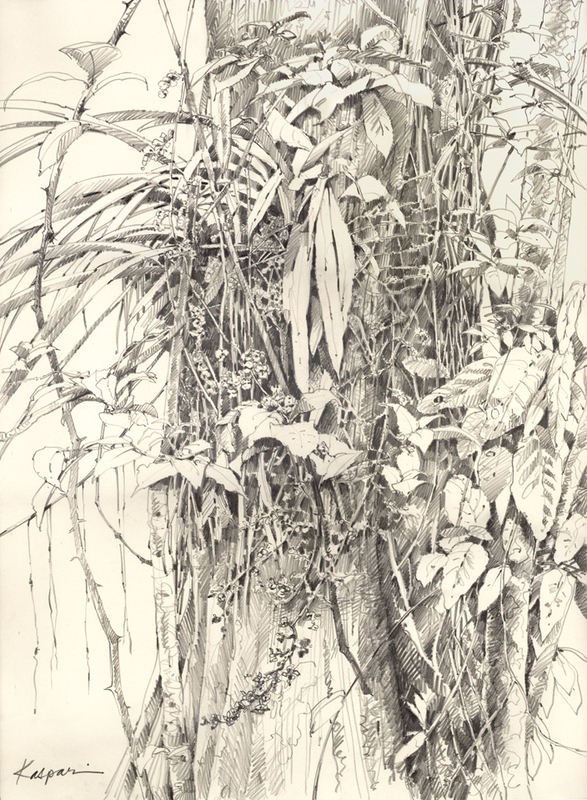 18″x24″ graphite on Rives BFK, drawn plein air on Barro Colorado Island. Cecropia roots and great tinamou. 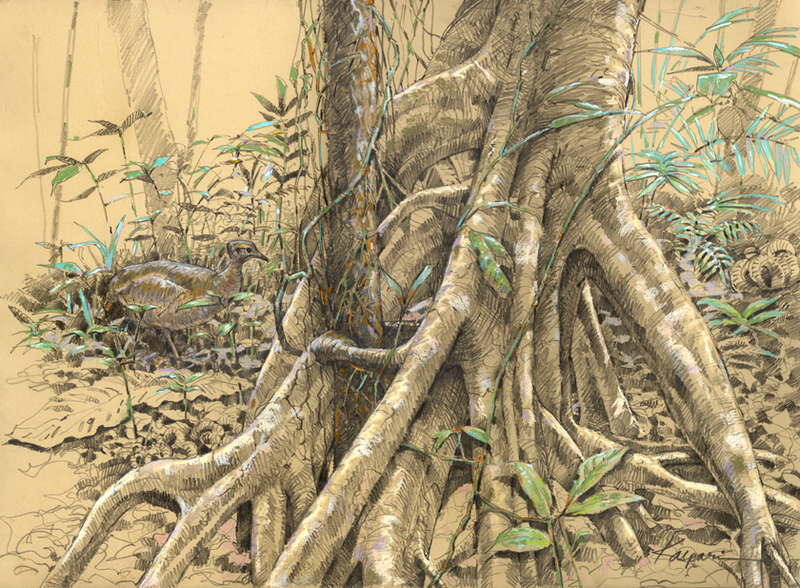 24″x18″ pastel and graphite on Rives BFK, drawn on Barro Colorado Island. 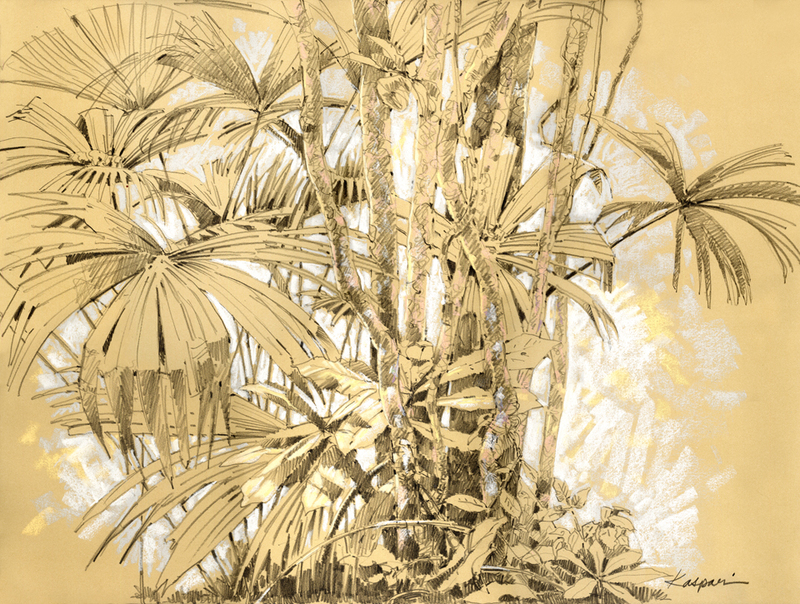 Bright-rumped attila reflects; 24″x18″ pastel and graphite on Fabriano Ingres toned paper, drawn plein air on Barro Colorado Island. Astrocaryum palm with hanging fruit clusters. 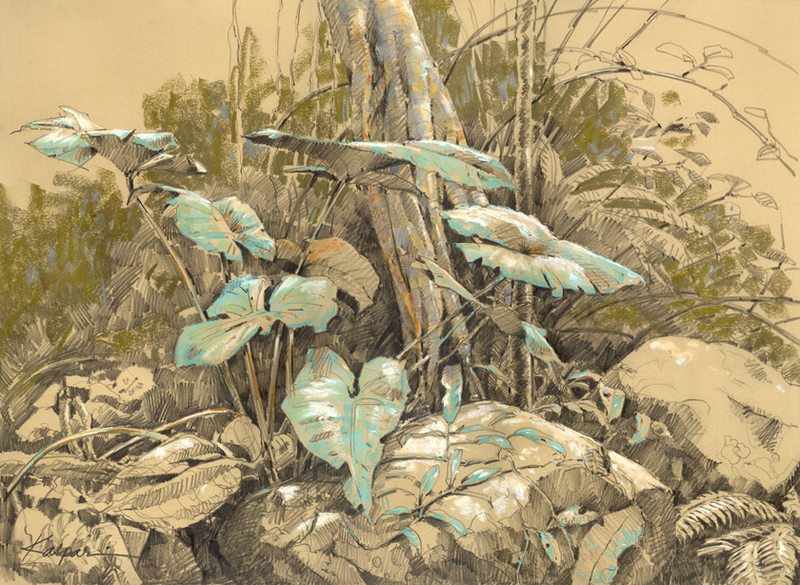 18″x24″ pastel and graphite plein air, drawn on Barro Colorado Island. 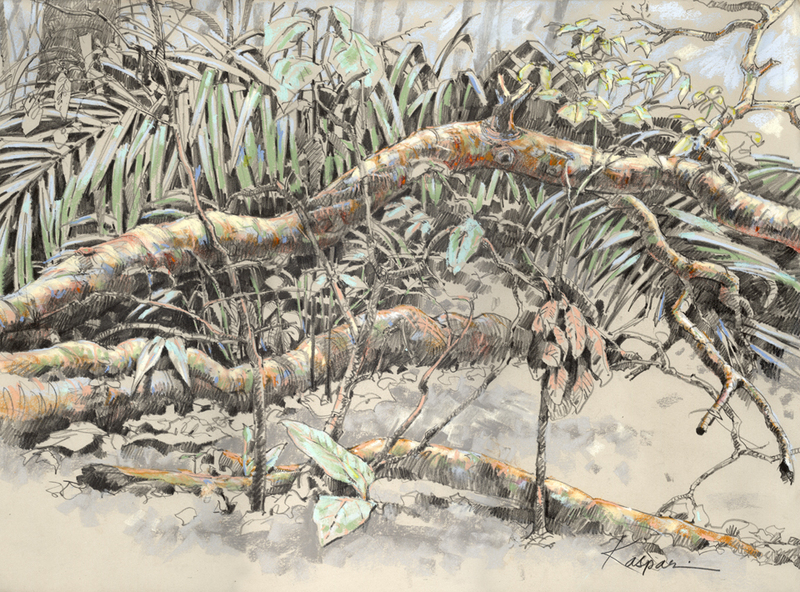 A big fallen branch means a new lightgap; 24″x18″ pastel and graphite plein air, drawn on Barro Colorado Island. My favorite is fallen branch it is what you left unsaid, the suggestion. I also am partial to palm tree perfect job of highlighting the right areas without getting fussy. Obviously all excellent. Rufus wins for color exuberance. They all are outstanding, but your treatment of the water in the Bright-rumped attila blows me away. I’m happy with this collection; all that shlepping and complaining and there you go, a good bunch of pictures to show for it. For a second there I thought I saw that you’d written ‘complaining’ as ‘compleining’, all the more fitting I suppose. It isn’t it nice when you finally have something to show for all of your work? I’m sure shlepping in heat and humidity, with possible monkey attacks and who knows what else, did make you wonder if it might not be easier to do all of the studies in the Moleskin and then do the finished work on larger paper back inside. Congratulations on seeing it all through. I think my favorites are probably: ‘Cecropia roots and great tinamou’, because the tinamou fits in so well and is quite a surprise, and maybe ‘Fallen branch’ for the range of value. I’m not really sure about the latter but for some reason the darkest areas really stood out to me. 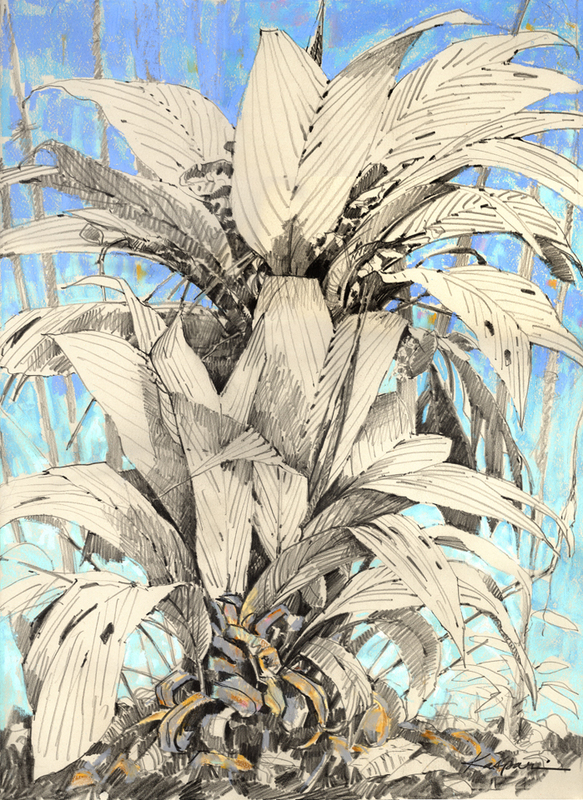 And then there is the monumental luminosity of ‘Small Palm.’ As usual it’s hard to fathom the ability to see and hold a mental image of all that detail long enough to get it down on paper. I just did a google search for “whippoorwill” and found your page. You win. Just wanted to let you know. You win. Wow, Trevor, that’s great news. What have I won? Thanks for coming by- please come back again! P.S. Have you read The Wild Trees by Richard Preston? Good luck with your work- sketching as you hoof it through the woods is a fine aspiration and you can do it, too. I am totally enchanted with your drawings. And I loved your cowboy shabbat poem. Come back to Panama with your sketchbook, and spend a little time in our shtetl of Boquete! Boquete has a shtetl? I’m so there! Seriously, Boquete is supposed to be a wonderful place, with great birdlife. I’ll see if I can get up there one of these days!